“Patrick Morrisey is protecting our Second Amendment. He is endorsed by the NRA and West Virginia gun owners,” the narrator says as images of Morrisey talking and looking over firearms flash across the screen. Morrisey’s A+ NRA rating and endorsements from Gun Owners of America and West Virginia Citizens Defense League are branded over the video. “Liberal Joe Manchin is lying to West Virginia,” the narrator continues. Morrisey’s campaign highlighted Manchin’s D rating from the NRA upon release of the ad. Trump’s message at the West Virginia rally, “A vote for Morrisey is a vote for me,” flashes for the second time to close the ad. Manchin was the sole Democrat who voted for cloture on the nomination of Judge Brett Kavanaugh for the Supreme Court on Friday morning, though it was not the deciding vote. It remained unknown at the time whether he would ultimately vote yes or no on Kavanaugh’s confirmation. This comes as Manchin slid to a narrow four percent lead over Morrisey in a Senate Leadership Fund poll that revealed five percent of voters were still undecided. 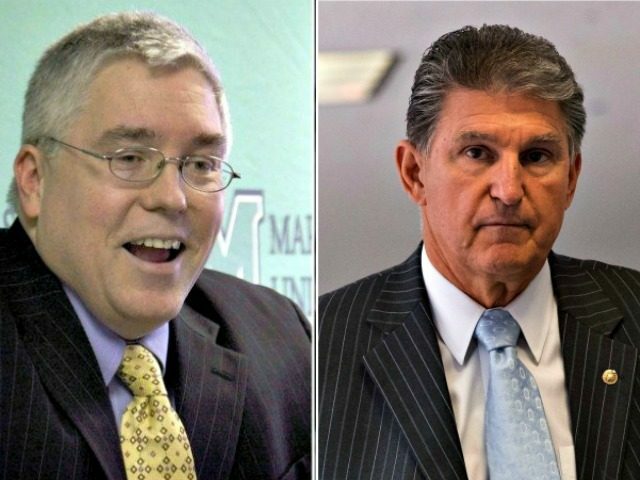 A competing poll from the Democrat Global Strategy Group showed Manchin leading Morrisey by double digits.